Who knew a simple hand-painted scarf could be so exquisite? Each of the scarves shown here began as a plain white rayon scarf. The process for painting these takes place in stages beginning with creating a variegated background. 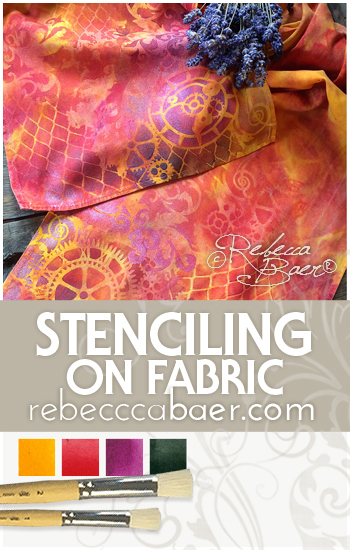 If you'd like to know more about this process check out "Painted Fashion" and "Fashion Accents". Each explains the process in step-by-step detail. Substitute colors as desired to created a variety of backgrounds ready to enhance or embellish. As an added benefit both "Painted Fashion" and "Fashion Accents" include detailed diagrams for creating beaded fringe. To create the vibrant foundation for "Steampunk Firestorm", shown below, I used a combination of Red, Orange and Yellow Jacquard Textile colors. You can find these paints here (and on sale-woot!). I used the same paints in hues of blue, blue-green, green and violet to create the soft, pastel base for the "Seafoam" scarf, above, right. To create a pastel look like this simply water down the paint. Once the backgrounds were complete I proceeded to add unique details to each. Both of the scarves shown here used a few coordinating stencils to achieve the trendy collage-style look. To enhance "Steampunk Firestorm, shown at left, I used the smallest Steampunk Clockface stencil along with the medium size Urban Jungle and Steampunk Pocket Watch stencils. 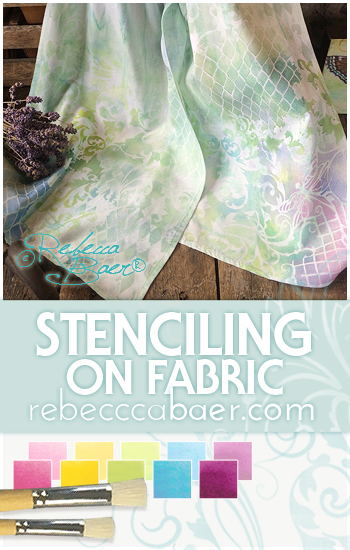 To embellish "Seafoam, shown above, I used the medium size Urban Jungle stencil along with Harlequin Damask and Dragonfly Fantasy, also in medium size. The hand painted scarves can be further enhanced with beads, gems or other finery. There are no boundaries when creating for yourself or a special someone. Perhaps these inspire you to make your own magnificent fashion accessory or maybe you'd like to purchase one already made for you. Each scarf is a unique work of art hand painted to create an original one-of-a-kind designer accessory.